Last update issued on July 11, 2003 at 03:15 UTC. Minor update posted at 09:51 UTC. The geomagnetic field was quiet to unsettled on July 10. Solar wind speed ranged between 327 and 383 km/sec. The solar wind disturbance which began after 18h UTC on July 9 intensified after 16h UTC and the interplanetary magnetic field has since been moderately strongly southwards. Solar flux measured at 20h UTC on 2.8 GHz was 122.9. The planetary A index was 8 (STAR Ap - based on the mean of three hour interval ap indices: 9.5). Three hour interval K indices: 22223233 (planetary), 21224323 (Boulder). At midnight there were 6 spotted regions on the visible disk. Solar flare activity was moderate. A total of 10 C and 1 M class events was recorded during the day. Region 10397 rotated out of view at the northwest limb and was quite active most of the day. A minor M class flare is still possible while the region is just behind the limb. Flares: C2.8 at 00:51, C2.1 at 02:34, C2.9 at 03:42, C3.1 at 04:41, C1.8 at 06:09, C5.2 at 06:45, C1.2 at 07:52, C1.3 at 08:54, M3.6 (associated with a strong type II radio sweep) at 14:12 and C1.4 at 16:30 UTC. Region 10400 decayed quickly and lost about two thirds of its penumbral area. Region 10401 developed quickly with a large increase in penumbral area. The region is magnetically fairly simple with the exception of a section in the northeast where the positive and negative polarities are not well separated. Further development could cause the formation of a magnetic delta structure in that part of the region. Region 10402 decayed slowly and rotated partly out of view at the southwest limb. Flare: C1.2 at 11:40 UTC. Region 10403 decayed further and had only a couple of tiny spots left late in the day, the region will likely soon become spotless. Region 10404 decayed and lost its trailing spots. [S200] A new region is rotating into view at the southeast limb. Location at midnight: S10E82. Comment added at 09:51 UTC on July 11: The solar wind disturbance mentioned above finally caused a geomagnetic disturbance. The interplanetary magnetic field strengthened further and was strongly southwards after 06h UTC. From 08 to 09h UTC major storm conditions were observed with the planetary A index reaching 93 for the 06-09h UTC interval. Some high latitude magnetometers recorded severe and even very severe (K=8) storm conditions. Taking into account the low solar wind speed and events over the recent days, the disturbance could be related either to a large filament eruption (and CME) near the northwest limb, or an M flare with an associated CME in region 10400, both events occured on July 6. A long duration C3 event peaked at about 07:38 UTC. The source of this event was a flare in region 10401 and a nearby erupting filament. Coronal movement was observed afterwards a significant distance from the source of the event and it is likely that there was a CME. With the event center near the center of the disk the CME has a high likelihood of becoming geoeffective and could reach Earth on July 14. July 8-10: No LASCO images available. There is a problem with the SOHO high gain antenna. Until the high gain antenna is in a favorable position starting from approximately July 14, SOHO science data will be transmitted over a low gain antenna and only a limited amount of data will be available. 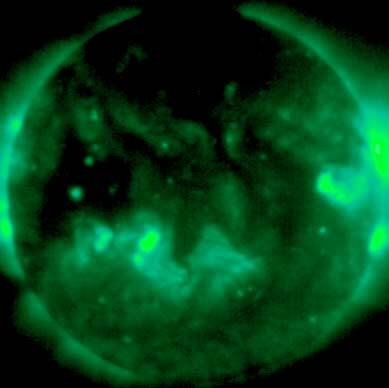 A recurrent trans equatorial coronal hole (CH47) was in a geoeffective position on July 8-9, this coronal hole appeared to be decaying on July 9 and 10. Another coronal hole (CH48) in the northern hemisphere and with a trans equatorial extension will rotate into a geoeffective position on July 12-14. Processed GOES SXI coronal structure image at 16:24 UTC on July 10. The darkest areas on the solar disk are likely coronal holes. 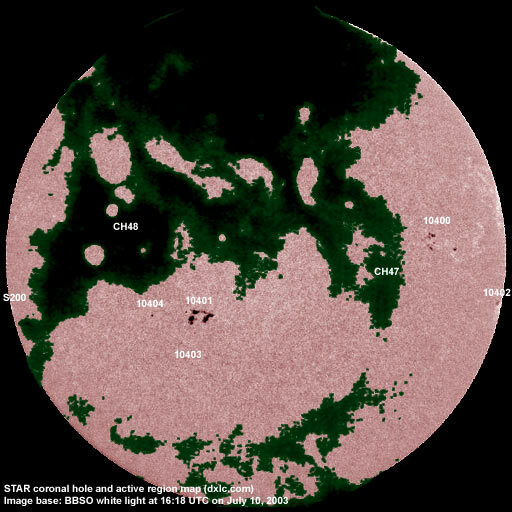 The geomagnetic field is expected to be unsettled to active conditions on July 11-13 due to a high speed stream from coronal hole CH47 while the high speed stream from coronal hole CH48 will cause unsettled to minor storm conditions on July 15-17.